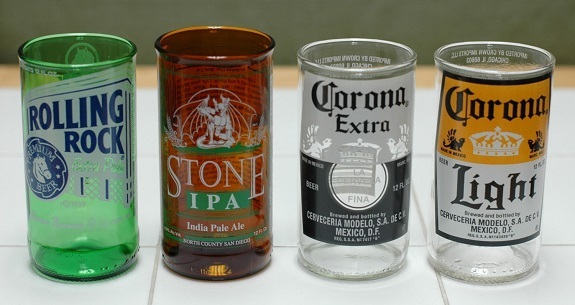 Ever wish you could turn those empty beer bottles into drinking glasses? Well in 5 easy steps you can do just that. They make unique glasses to stock your cabinets with. It’s extremely simple to do if you have the right tools, those tools being the following: a piece of string, an empty beer bottle, lighter fluid, a lighter, sandpaper and a sink/bucket full of cold water. This also works with wine bottles (or any bottle really), so if you want to do something creative with those this will work also, although it may require a bit longer burn on the string to heat the bottle a bit more. Sprinkle some silicon carbide powder on a flat piece of glass. Spray it down with some water. Start to rub the glass onto the surface in a figure 8 motion. When the noise of the grit against the glass dies down a bit, you will know it is just about done. Click here for the easy 5 step process. If you like this post, please feel free to share it. Previous Post Can Schick Hydro Make You Funny?